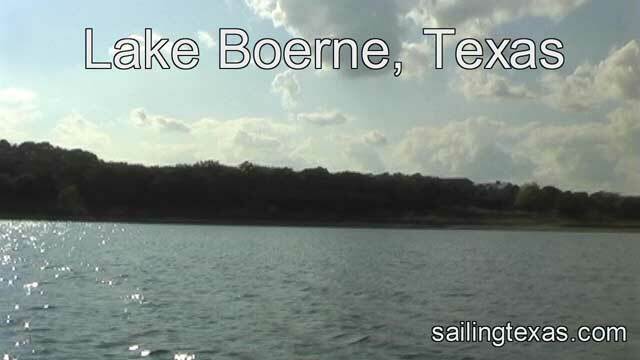 Lake Boerne is located just south of I-10 as it passes through Boerne, Texas. Formed by damming Cibolo Creek in the 1970's, Lake Boerne provides water to the city as well as swimming, fishing and boating. In 2005 the city of Boerne began improvements at the park adjacent to the lake. The park now has picnic areas next to the lake, a fine boatramp and parking lot, courtesy dock, fishing pier, volleyball court, pavilion, playground and restrooms. More improvements are planned including a frisbee golf course. We had not been to Lake Boerne before, so we drove around to see the park. Lots of trees by the water provide shade for the picnic areas. A large mowed field next to the volleyball court, pavilion and restrooms has many possible uses. The boatramp is very good, although there is a tree overhanging one side. The lake was done about 8 feet, but we still had no problem launching the Flying Scot. The floating dock was fairly close by the ramp, the fishing dock closer to the dam. Lake Boerne is only about 189 acres, but since boats with combustion motors are not allowed, it wasn't crowded at all. We saw 2 or 3 small fishing boats with electric motors and one other sailboat. Even though the lake was down 8 feet, we sailed all over the main body of the lake never touching botoom. We also sailed up the creek, and getting near the end we started hitting submerged logs or stumps because of the lake being low. Very clean water when we were there, you could see fairly good through the water. 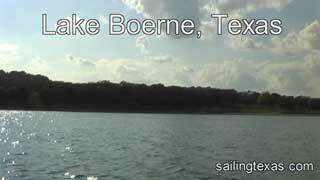 A good lake for small sailboats, fishing and swimming, I recommend a stop at Lake Boerne. No glass containers and no camping, day use only. Park curfew is midnight to 5am.